Wage a battle between light and dark forces with the Star Wars Bocce Ball set from Kelsyus! 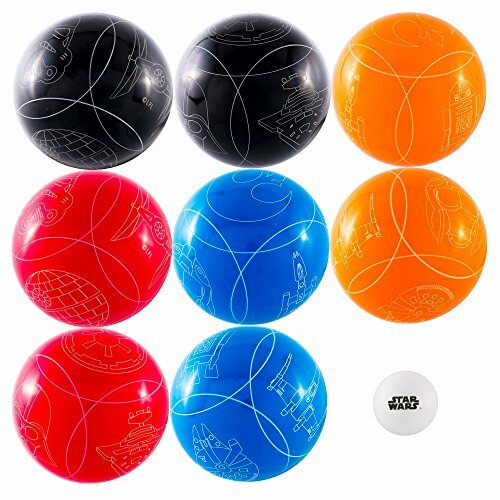 Each bocce set includes eight 90 mm size laser-etched resin balls in four different character styles for easy team designation, one 40 mm size pallino ball for scoring, and one Star Wars carry bag with two zippered compartments to help protect the balls during transport and storage. This high-quality bocce ball set makes a great gift for Star Wars fans who love the outdoors and is fun for the whole family! Wage a battle between light and dark forces at your next backyard get-together or picnic with the Star Wars Bocce Ball backyard game set! Eight (8) 90 mm size laser-etched resin balls in four character styles for easy team designation. One (1) 40 mm size pallino (or "object") ball for scoring. One (1) high-quality zippered Star Wars carrying back with two compartments to help protect balls during transport and storage. Game instructions included. Bocce requires two teams of 1, 2, or 4 players on each team.